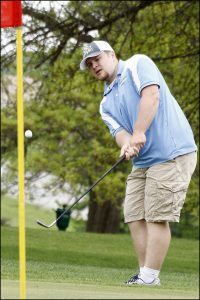 The L-S boys golf team had their conference meet on Monday, May 8. The meet was held at the Oakland Acres Country Club, an 18-hole par 69 course. With this being the conference meet, there were a total of 11 teams competing. A chip by senior Trevor Squires gets his ball closer to the hole at Oakland Acres. The course was difficult due to the fact that it had some long low-par holes and hazards that played close to the fairways. Individually, junior Holden Jansen led the team with a 92 and was the No. 25 golfer out of 66 total. Seniors Isaac Collins and Trevor Squires followed close behind with respective scores of 112 and 113. Sophomore Abram Collins rounded out the team score with a 117, freshman Logan Ingersoll had a 123, and sophomore Cade Dibello rounded out the varsity golfers with a 139. Jansen was six strokes from placing at the meet, where there were a total of four players that scored an 86 that took the bottom end of the top 10 golfers. “I thought the course was pretty difficult, but it wasn’t that bad. I played fairly well considering the difficulty of the course,” said Jansen. The Hawks put together a team score of 434 for 11th place. Belle Plaine won the SICL title with a 343. 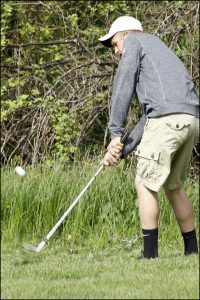 Junior Holden Jansen chips up the ball to get it to the green at the difficult Oakland Acres course on Monday, May 8. He was the top L-S golfer with a 92. The boys will have sectionals this Friday, May 12, at Prairie Knolls Country Club in New Sharon.